Few Android phones are as highly anticipated as the latest Samsung Galaxy S. If you're yet to read our full Galaxy S7 review, here's the short version: it's good. What's important now is whether the Galaxy S7 is the best upgrade option for fans of the series. To help you with the answer, here is our Samsung Galaxy S7 vs Galaxy S5 comparison. The Galaxy S5 has been the subject of more criticism for its design than almost any other Android phone. Even other manufacturers were taking jabs at it. The main reason? Its rear cover looks ugly. What's more, the S5 has a chrome-effect plastic rim surrounding the device, and it's not pretty. The S5 was a misfire for Samsung and a let down for an expensive flagship phone (particularly in light of metal-clad iPhones). Samsung made improvements with the Galaxy S6, but it still had it's problems (like its protruding camera sensor). But now the Galaxy S7 is here, and it's delicious. The design doesn’t stray far from the formula – a glance at the front of the phones reveals many similarities – however, the S7 is housed in glass and metal. Not only does this look and feel better, but it features a pleasingly curved rear; comparing the feel of a squared-off phone like the Nextbit Robin to the rounded Galaxy S7 highlights how comfortable it truly is. The S5 isn't particularly uncomfortable to hold, but a rubberized, dimpled back does not compare to the smooth, curvy Galaxy S7. Both S7 and S5 house a microSD card slot, though the S7's does not take full advantage of Marshmallow. Still, the microSD cards work the same in both devices, and the Galaxy S7 has even better water-resistance capabilities (IP68 certified for dust and water compared to the IP67 S5). In many ways, the S7 only provides fractional differences. The S5 rear is curved, it's just not as pronounced. The camera and button placements are very similar. Despite the subtlety in the distinction, though, the Galaxy S7 is the clear winner in design and it only took me a moment to notice this when I held both. The S7 is more luxurious and more comfortable, like a designer lounge chair compared to a piano stool. The Samsung Galaxy S5 has a Full-HD (1920 x 1080 pixels) display while the Galaxy S7 has a QHD (2560 x 1440) display resolution, but the difference is in the details: the advantage of the S7 is best observed when viewing high-resolution media. However, you will notice some differences elsewhere. One advantage that is immediately apparent is the side bezels of these phones. The Galaxy S7’s are far slimmer, almost half the size of the S5's. The Galaxy S7 display is also more sturdy, guarded by a layer of Gorilla Glass 4, compared to the Gorilla Glass 3 on the Galaxy S5. As for color representation, there is a lot of pink in the S7 display, but that's also what gives the phone its warmth. At a 45 degree angle, that pink is cut right out and you get a much bluer tint, while the S5 retains better retains its color. Regardless, the S7 is brighter than the S5, it can really blast out big colors. But the difference is in the margins and a side-by-side viewing of most day-to-day smartphone elements, like messaging apps or websites, look much the same on both phones. The Galaxy S7 does have the 'advantage' of always-on display capabilities. This means that it can be used to permanently show device information like time, date and notifications with only a minor hit to battery life. For me, this took some getting used to and more often than not it was a distraction. It’s divisive, it's not an essential feature, it can be turned off, you decide if it's worth it. Overall, the Galaxy S7 display is a little warmer and brighter, and because of the higher pixel count, better suited for VR. But if you want a far better display, this shouldn’t be the main reason you choose the S7 – the S5 still holds up. Soon enough the Galaxy S5 will have Android Marshmallow, but for now it's still on Android Lollipop. The Galaxy S7 arrives with Android 6.0.1 Marshmallow, which includes some nice additions, especially in the battery and games departments, but the majority of these will be available to S5 owners too. Performance on the S7 is superior to the S5. It has a faster processor – a Snapdragon 820 or equally powerful Exynos 8890, depending on your region – which is optimized for even simple tasks, not just demanding games. Basic navigation of the interface is smoother on the S7 and it's backed up by 4 GB of RAM. The S5 features a Snapdragon 801 and 2 GB of RAM combo. The Galaxy S5 isn't behaving like your old Windows XP laptop, it's still running fine on Android Lollipop, but it's certainly inferior in software and performance compared to more modern flagships. The S5’s speaker is rear-mounted and easily covered. The S7’s is on the bottom, which is a better placement, and also sounds cleaner and less tinny. Neither produce standout audio quality, though. The Galaxy S7 camera is 12 MP with f/1.7 aperture, optical image stabilization and dual pixel technology. The Galaxy S5's is 16 MP, with f/2.2 aperture. Like the Galaxy S5's display, its camera has also held up well in the last two years. You can check the galleries in the full reviews to see a bigger selection of shots, but below is a slice of what they both offer. The Galaxy S5 photo is always on top, followed by the Galaxy S7. I took them in automatic mode with HDR off and dropped the S7 resolution down to 9.1 MP to fit a 16:9 aspect ratio (except for the selfie, taken at the 5 MP maximum at 4:3). The S5 shots were taken in 16 MP at 16:9 and the selfie at the 2.1 MP maximum. What does this tell us? The takeaway message is that the Galaxy S7 camera is discernibly stronger in most scenarios, and actually one of the finest cameras I've ever tested. There's no area where it is inferior compared to the S5, and most of the Android competition. It's capable of performing whatever you throw at it. The Galaxy S5 battery life began relatively strong and then Lollipop hit and there were a few months where complaints about it were rife. It seems to be all straightened out now, and the S5 battery life remains strong. That being said, the Galaxy S7 seems to be even better. Although in the past week since we received our review model we’ve have only been able to run it down to 0% battery a handful of times, it has so far been the better battery performer, helped along by its impressive fast charging capabilities. During this test, I was able to pump 23 percent juice into the S7 in just 15 minutes of fast charging. It's a load speed that the Galaxy S5 just can't compete with. The S7's battery may not be removable, but with Doze and fast-charging, maybe it’s not a feature that’s so necessary anymore. The Galaxy S7 starts at around US$699 for the 32 GB version, but if you're really fast, you can get a free Gear VR headset with it. The Galaxy S5 is currently sitting off contract on Amazon for between US$350 and US$375. Now, I don’t just want to shower the Korean smartphone giant with needless praise just because a new phone is here and it’s better than a two-year-old phone. It’s better, of course it’s better. But is it your only upgrade choice if you’re a Galaxy S5 owner? It’s not your only choice, but it is your best choice if you fit into one of several categories. If you like the Samsung Galaxy S look, this is the best it’s ever been. If you like Samsung's software (TouchWiz), this is the best it's ever been. If you like Samsung's Super AMOLED displays... you get the picture. Basically, if you like the Galaxy S5 and just want to know if the Galaxy S7 is a safe upgrade, then yes, it is. It's the more advanced version of that device you love, with little in the way of cut corners. It's also, as it happens, one of the best phones currently available on Android and I'd have no qualms recommending it to anybody looking for a new phone in its price range. Galaxy S5 owners: is the Galaxy S7 tempting you or are you eyeing another Android device? Reach out to me on Twitter (@scottadamgordon) or leave your thoughts in the comments. The S5 has one huge advantage: durability. You can drop it without it shattering. I realize I may seem really late commenting on a nearly 2 year old article, HOWEVER, not everyone rushes out to by the latest device as soon as one comes out. I like the S7, and in all but one area it is a valid replacement for my S5 EXCEPT for the non-user-replaceable battery. I say this not because I would need more battery life on a daily basis (I don't), but because my S5 is currently on it's third battery. With an easily replaceable battery one does not simply toss a $700 device when the battery degrades, one pops in a new one and motors on. The lack of an easily replaceable battery is often dismissed by reviewers, as those reviewing devices only look at how long a single charge will last, not how long the device will remain usable before needing replacement. Anyway, very good comparisons and reviews - you have a new subscriber. I wanted to share a nice little app i found today which brings the Galaxy S7's Always On Display to the Galaxy S5 (or any other android phone with an AMOLED display). It's free but if you'd like to change the font of the information on the screen you'd have to buy the pro version. There is also a Donate button at the bottom. This app is perfect because it doesn't conflict with xposed modules like Screen Off Animation. And here's the app itself, hope to see a more in-depth review from the AndroidPit team soon. Cheers! I have the s5 and am still LOVE it although the battery dies in less than 4 hours! The photos are fantastic, as good as my Nikons. I took the update to 5.0 and it destroyed the phone in capabilities and especially speed. Luckily there was a way to back it out to 4.4.2. The only good thing about 5.0 was that you could move stuff to your sdcard where KitKat can't. Besides the s5 was built with KitKat which was horrible in my older Droid Razr Maxx which was built for Ice Cream Sandwich. Seeing that the s6 had Sony Steady Shot was very enticing as the s5 is horrible for videos, but the lack of access to the battery turned me right off. Just wondering if the Steady Shot is available on the 7 but the loss of 3 megapixels doesn't make any sense... Why build a new flagship with less? New to your website and so glad I stumbled across it! My husband and I just received our s7 Edges and I feel indifferent. I'm not sure if I truly love them yet! We're undecided if we will be returning them and keep our s5's for now. The reason why we switched was because of the brutal lagginess of the s5's. I would have to reboot my phone several times a day when it would get sluggish or frozen. I also (sometimes) had to redial/hit a number on my phone a dozen times to get it to dial! That's not an over-exaggeration either, sadly. Do you recommend anything? Should we stick with the s7 edge, return them and stick with s5, or return them and get something completely different? I don't know how I feel about the edge yet, truthfully. I may even just return them for the standard s7, which was in your review. Any and all suggestions/recommendations are appreciated to this newbie. Thanks! Hi sarah, i too am experiencing the dreaded lag of an s5. Did u keep s7/s7edge? If so, do u recommend it? Thank you for this great article! For the first time, I am seriously considering an upgrade for my beloved S5. Before I pull the trigger, my concerns: No Gorilla glass anymore? Is this true? Is that stupid flap gone from the charger port? God I hate that thing. This would be a plus if they removed it as it appears in your side-by-side photo. Will this issue on the SD card full capacity and Marshmallow be corrected soon? Can I use my Google Hangouts for SMS? I am reading elsewhere that some 3rd party apps are bunk on S7. Would love your comments back if you can ! The new s7 does not have the gross flap for the charge port anymore - hooray! 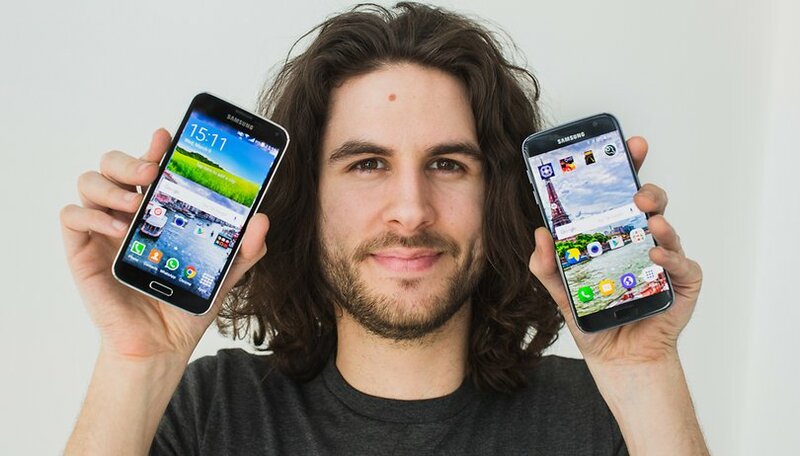 I also hate mine on the s5, haha. The S6 and S7 backs are as slippery as hell, as is all the metal/glass backed phones. The plastic rubbery effect back of S5 will help grip in your pocket and hand, and is light as a feather. Plus you can get at the innards. Only journos kept on about so called premium looks- anyone with half a brain cell will keep £600 pounds worth of soap slippery phone in a case anyway, so looks get cancelled out- all about the way it performs then. Regardless of how good the S7 may be as I'm running a S5 now I wouldn't upgrade or downgrade to it. Next daily is going to be a nexus. Samsung are awful with updates. We want updates not having a to buy a new handset to get the newest android os. Absolutely love my Excellent Samsung Galaxy S5 running Android 5.02, it's a fantastic phone, brilliant Camera, battery and rarely crashes or lags. I so wish my contact was about to finish, the S7 is gorgeous. I'll have to wait for the S8 which if they get as good as the S7 will be fab. I really like Touchwiz, I love all the extra features (Airwake, Air Swipe etc). I prefer a few of the pre-installed Samsung apps such as Video player, SHealth. There will always be people who moan about every Samsung Galaxy, they will never be happy. My plan finishes at the end of this week, so happy that the upgrade is free.